a) There are many people who have had the autosomal DNA test done, but who have only researched their father’s side of the tree. Autosomal results are based on both sides of your tree, so it isn’t as if they are highlighting the side of the tree that their test was for. When I contact them, for the most part, their maternal roots seem to be an afterthought, which is kind of sad. This surprised me. I had my test done at FTDNA which has an Azorean DNA Group, so the outreach is there. I have my Azorean tree researched well into the 1700s and to the 1400s on a few lines, so the opportunity to connect with people is there. My roots are long and deep in one village, Maia. But, other people with roots there have not connected to me. 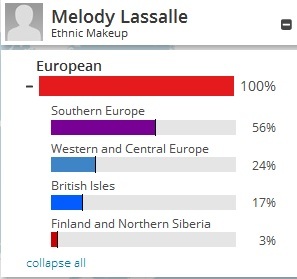 I do know that my DNA checks out because I connect to my Pacheco 3rd cousin. The majority of my hits have resulted on my English and Irish lines…the ones I know little about and don’t have enough information to connect with people…YET. c) I have had a fairly good response rate. I have made confirmed distant cousin connection with two people. Yet, I have not been contacted by anyone through GEDMatch or FTDNA since my results came through. I am assuming many people draw at line at which generation they are willing to contact. What the experience has stressed for me is the importance of research. For example, There is a family that I’ve now matched a woman, her brother, her sister, and her son–all in the 3rd to 5th relationship range. I also match another woman in the 2nd to 4th relationship range who matches the brother and son (but not the woman). But, our research limits us and we’ve yet to resolve where we connect. DNA research is handy tool for researchers. But, you still need to do the research in order to figure out the connections. I knew this coming in, but given some of the responses I’ve gotten back, I wonder if others know it? I would not discourage anyone from getting their DNA tested. It’s a fascinating journey. But, I think expectations need to be realistic. If you aren’t willing to get your hands dirty with research, you aren’t really going to get much out of your DNA results.